Sam communicating important information even if on an after hours, emergency call. When trying to discern where relationships or organizations have their biggest issues, it often boils down to communication. Too often one speaks one thing and another hears something entirely different. The end result of a "failure to communicate" is that not only is the goal not reached, but hardship, inefficiencies, frustrations or other errant consequences occur. 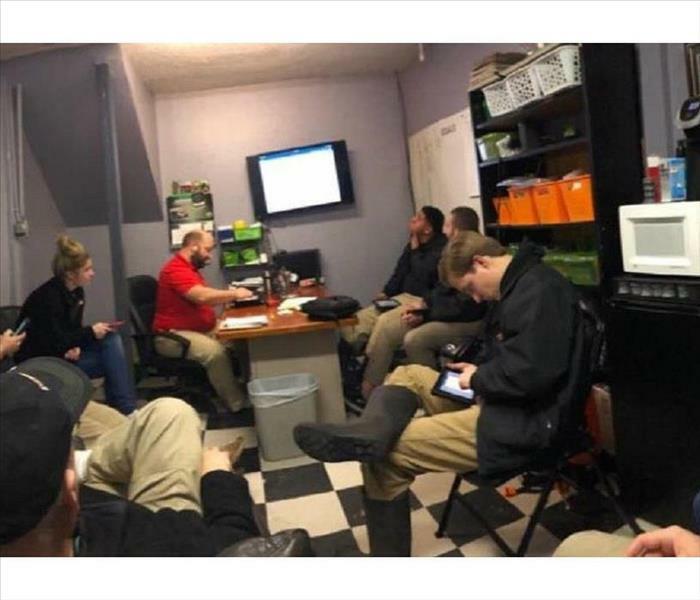 The SERVPRO of Greater Broken Arrow team is steadily increasing their diligence to let each team member know exactly what is being needed, seen, done, etc for each of our customers in real time. That has been so helpful to know how each one can support the team as we serve our valued customers. By using explanations, diagrams, pictures, documents, etc. Each one has a reasonably accurate idea of how each job is going and how they might be able to assist a team member if the need arises. We are also able to keep our customers updated on the progress of their individual job loss information. Call us. We would be honored to be the team to help you during an unexpected water, mold, or fire emergency! Enjoy the beauty of nature, while reading its signs. Some, like my sister with her arthritic knees, have a built in weather predictor. 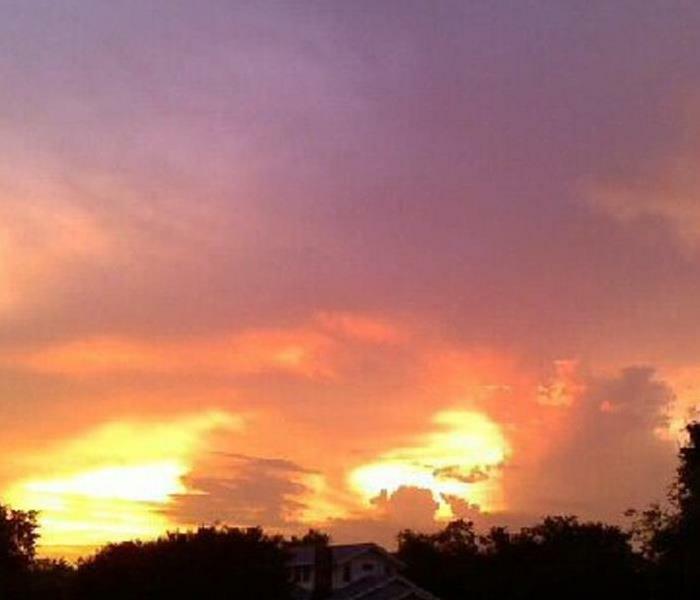 Others rely on watching nature- they sky, of course, various bugs, cat behaviors, birds, certain plants, etc. I was reading the Farmer's Almanac website to see what an organization says that is 80% accurate about predicting the weather since 1792. It seems likely that the temperatures in our beautiful Green Country will be around or below normal, and the rainfall might be more common in areas away from Oklahoma. That sounds like a lot of outdoor opportunity for gardening, exploring The Gathering Place, baseball games, and picnics. However, Oklahoma is always a candidate for thunderstorms and the possible tornadoes that they can bring. Stay weather aware. Be prepared for what ever happens. And call SERVPRO 918-250-2300 if you find your home or business impacted by unexpected water from storm or other causes. We are always ready to help! Some of our valued customers have facilities in multiple locations. Several have encountered water emergencies recently in one building, then soon after one has been mitigated, dried and brought back to a preloss condition, another water issue has been discovered. It is good to realize that our customers know they can call us any time of day, any day of the year to report a problem, knowing that we will respond with minimal delay. 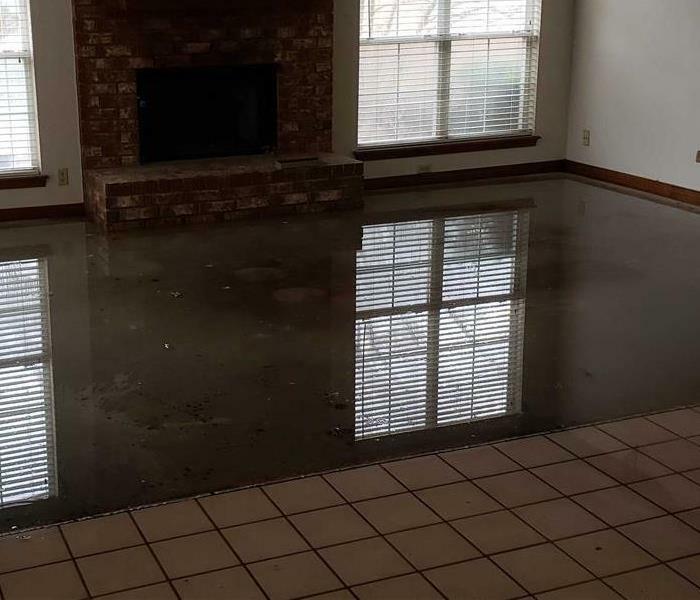 The SERVPRO of Greater Broken Arrow team is prompt to remove standing water, extract water from the flooring or carpet, inspect and use industry standards to create a drying plan, then set equipment and monitoring to get the building back to its preloss conditon. You can gain comfort in knowing any fire, smoke, water, vandalism, etc emergency affecting your business or commercial property will be conscientiously cared for by us. The SERVPRO of Greater Broken Arrow team spans generations and communities. We have a variety of perspectives and interests, but one very valuable thing that we each have in common is to do the very best job in the greater Tulsa - Broken Arrow area for our valued customers. SERVPRO Corporate offers many e-learning and on site training opportunities. Our SERVPRO team members are encouraged to add IICRC training to their set of certified training. We participate in daily communication about customer and job status reports, needs and accomplishments. We also hold regular meetings to check for ways to improve techniques, documentation, teamwork, communication, etc. When you find your business or home affected by flood, water leak, mold, smoke, fire, vandalism, storm, or other damage, you can trust the SERVPRO of Greater Broken Arrow team to have your back. When you discover standing water in your home or office, you pretty much know you are needing some assistance. With water damage, the faster the better is the mindset to adopt. The faster the water is extracted from the flooring and carpets, and sometime ducting, the less damage will occur to walls, cabinets, furniture and other contents. 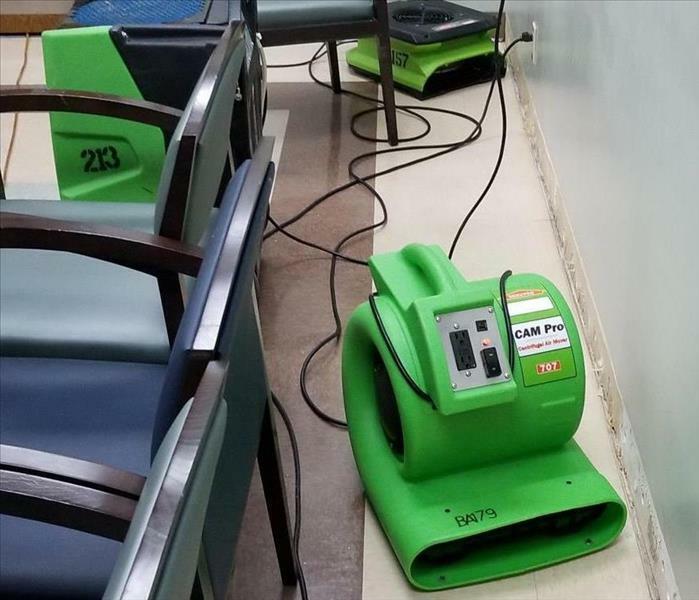 Since the well-trained SERVPRO of Greater Broken Arrow Team members live in areas around Broken Arrow and Greater Tulsa, we are always ready to quickly be onsite with proper equipment. We quickly assess the extent of affected area, remove the water quickly, and develop a game plan for drying the building efficiently. We will work with your schedule to allow access to in order to regularly measure and monitor the effectiveness of the drying equipment, removing equipment as drying your home or office to preloss humidity occurs. Give us a call. We are always ready to help. Sometimes you are looking for something specific and sometimes you discover something significant while searching. 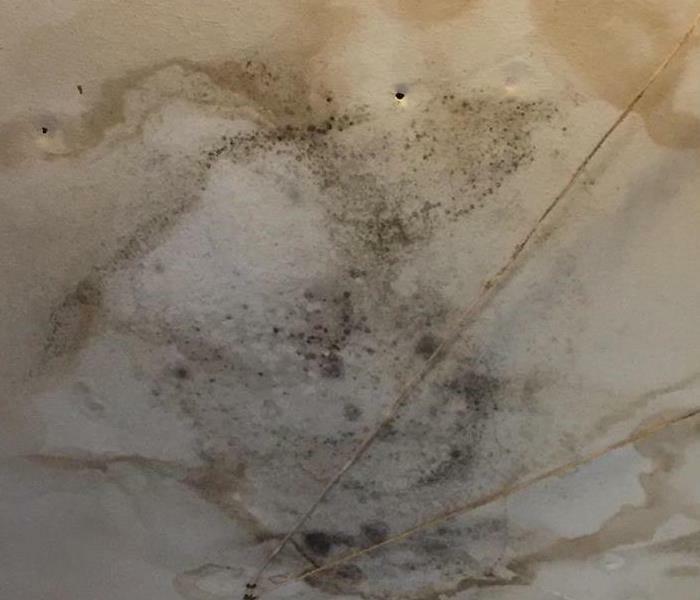 During a recent opportunity to serve a neighbor in our Broken Arrow community, a SERVPRO of Greater Broken Arrow team member observed something that just did not seem right. He wisely followed up his suspicion by scheduling a licensed electrician to investigate the situation. 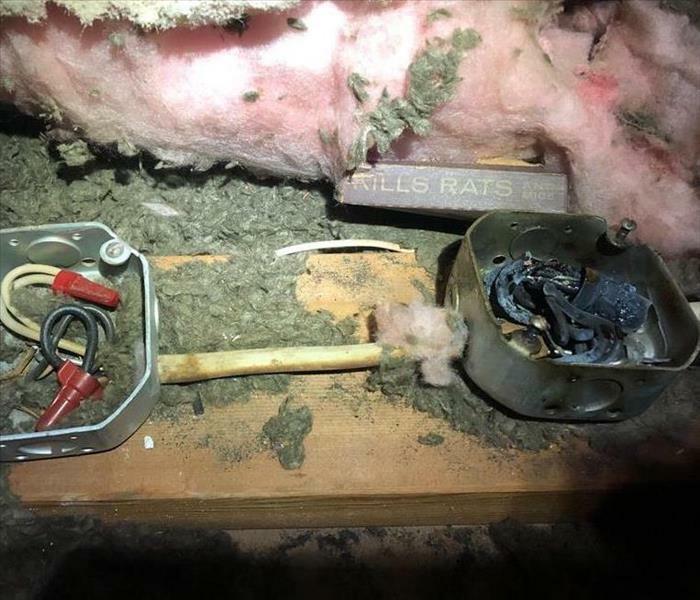 What the electrician found revealed that the home owner was spared a major house fire. For some reason, whether it was due to poor installation, corrosion, overloading, or whatever, there was melted wiring in a location in the attic. The electrician stated that the metal J Box saved that homeowner. Please be vigilant that any electrical work in your home or business be handled by a professional, or at least one who has been properly trained to perform electrical work that meets or exceeds safety standards. If you find yourself affected by smoke or fire, please call SERVPRO of Greater Broken Arrow. We are always ready to help. Northeastern Oklahoma was spared the fury of the winter storm that hit our fellow Oklahomans in the panhandle in December. Our meteorologists had given us plenty of warning about the potential of a significant winter storm affecting Green Country, then gradually lowered the alerts as the storm ingredients' characteristics changed. We did get plenty of rain, accompanied by note-worthy wind. 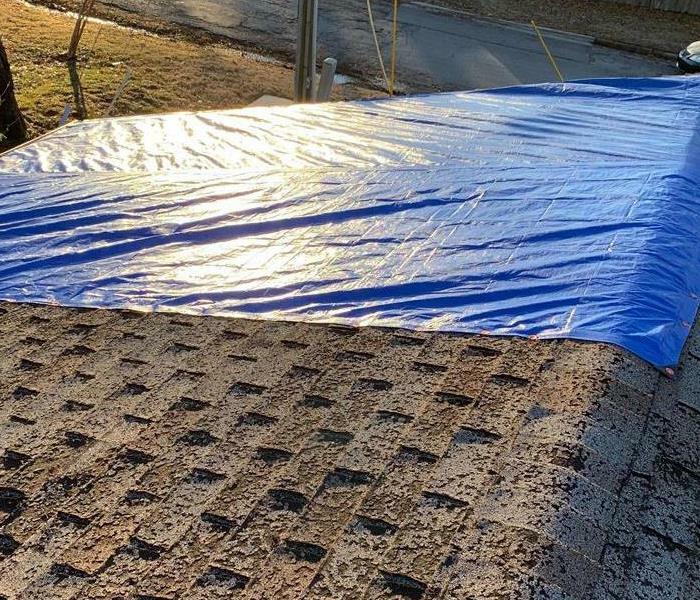 This homeowner's roof was compromised by an Oklahoma storm. Rain that seeped through the roof affected areas in the attic, insulation, walls, ceilings (which gave way from the weight of becoming saturated), flooring and contents. The SERVPRO of Greater Broken Arrow team was called in to remove the contaminated debris, contain the hole in the ceiling, begin drying the structure and contents, tarp the roof until repairs can be made. As we are working to get the residents' lives back to normal as quickly as possible, we are working within their insurance company's guidelines. A water leak often goes undetected for a while, especially if it is a slow leak or it comes from an obscure location. The longer water is unrestrained, of course, the risk increases that damage can occur. Finding this leak was a bit of a mystery. 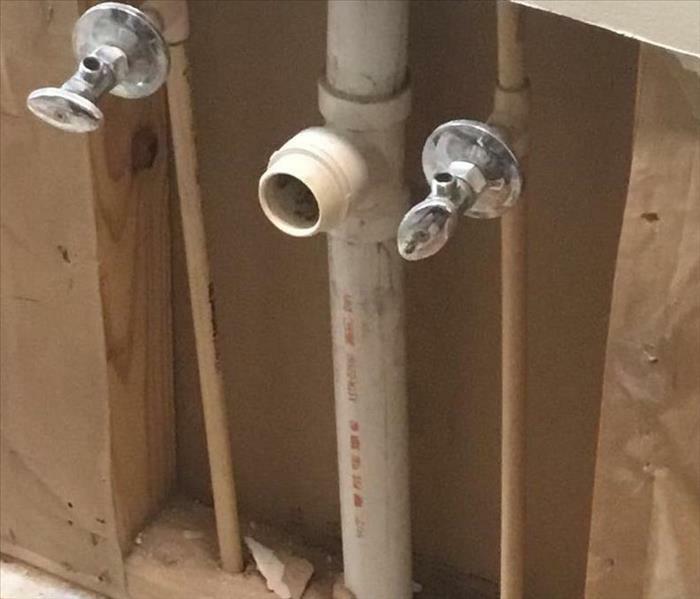 Turns out, the leak was inside of a wall and under a sink. As the water slowly spread, it affected walls, floors, sub-floors, cabinets not only in the primary room, the water also spread to the adjoining rooms. The home owner's insurance company knew who to call, SERVPRO of Greater Broken Arrow, of course. 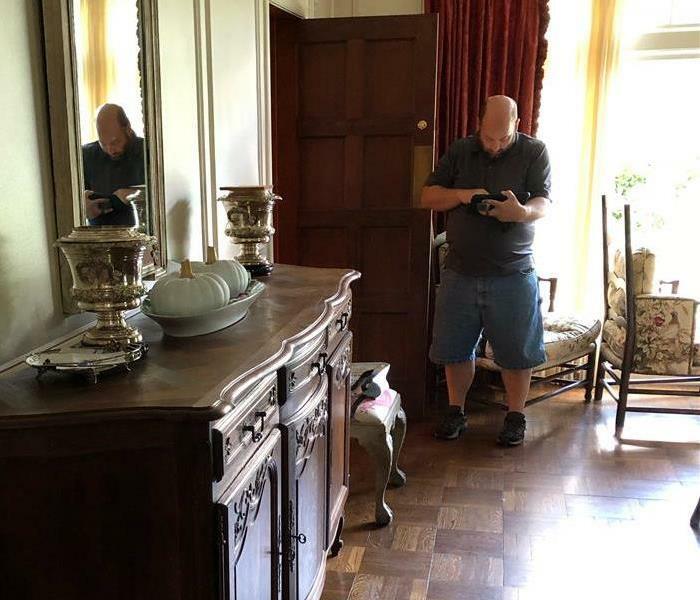 The team at SERVPRO was able to remove the unsalvageable materials and get the home back to preloss moisture in order that reconstruction can occur and the family can get their life back to normal. While battery-operated candles are pretty, and diffusers and warmers can add aroma, there is nothing like real candles for a lovely ambiance, especially during the colder seasons. Burning candles do pose an increased risk of fire, though. 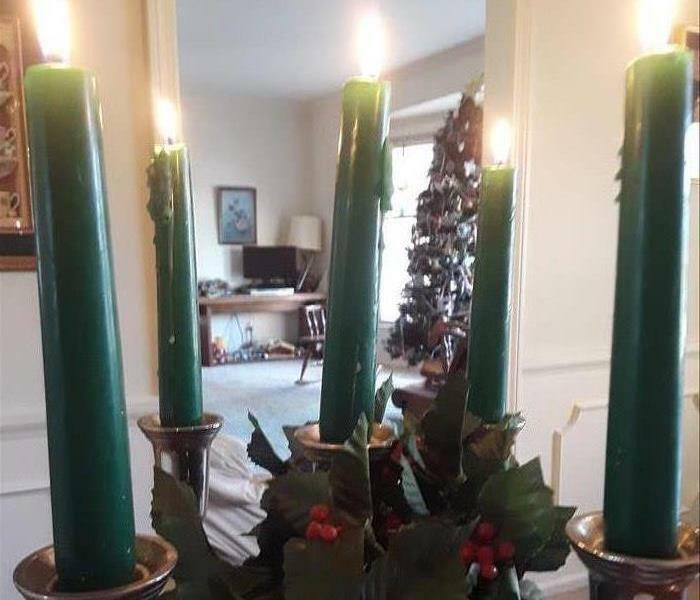 It is always good practice to review candle use safety. According to the National Fire Protection Agency, candles generally cause 2% of house fires, 3 % of deaths by fires, 7% of injuries from fire within a home, 4% of direct property damage from a house fire. Close to 37% of fires caused by candles begin in a bedroom. Being asleep while candle was burning was a factor in 11% of those fires, and 21% of the associated deaths. Three of every five house fires from a candle begin by combustible material near the burning candle. The top 3 days for candle-caused fires and Christmas, New year's Eve & day. We hope we never meet you as a result from a fire in your home or business- I'd much rather cross paths at the Gathering Place or while shopping. But if you do find yourself with damage caused by smoke or fire, please call us. We are always ready to help! 4/5/2019 - Predicting the weather?